This set contains 48 figures, which is about the industry standard. However what is anything but standard is the fact that all 48 are in different poses, making this by far the biggest number of poses in any set produced up to this time. There are two subjects in this set, which is rather odd as there seems no obvious link between them. Strelets say the set was inspired by a film called 'Ash' which has Polish troops fighting side-by-side with French engineers during the siege of Zaragoza. Usually we don't like mixing troop types in one box, and that attitude applies here as well, though one of the reasons for that is that it reduces the available poses for each type, and we can hardly complain about that here. The engineers are all dressed in siege-armour, and are using a large number of tools. The poses are very good, and include some nice ideas like the man mopping his brow. The man pushing the wheelbarrow required a fair amount of trimming and sculpting before the piece could be assembled properly as the parts were not a good fit. Apart from that all the figures come as one piece and look good. Three personalities have been included in this set. First is Napoleon himself, standing with hand tucked into waistcoat and wearing his famous hat and greatcoat. The second is Murat, easily Napoleon's most colourful marshal, who took great pleasure in wearing a huge variety of extravagant uniforms. Here he appears to be wearing his favourite bad-weather attire, a fur-edged pelisse with a low czapka, and he is carrying the most enormous telescope. Finally the mounted officer is General Poniatowski, wearing the uniform of a general of the Duchy of Warsaw. This figure does not fit his horse well without some work with the knife. The majority of the figures are of the Polish infantry. These have been nicely done, with realistic variation in uniform and equipment, and some wearing greatcoats. The flag has been engraved with a Polish design, which is OK but we always prefer to see no engraving so we can choose what design to paint if we wish. 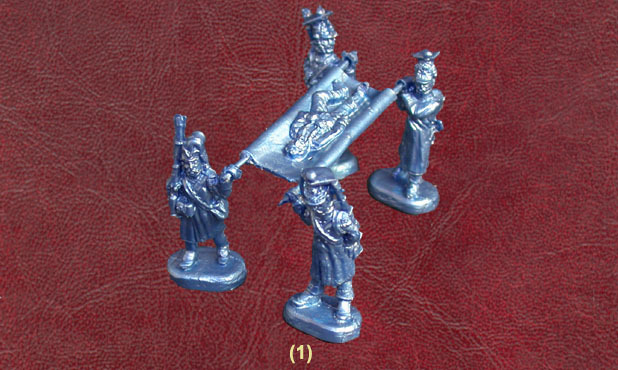 Two figures appear to be pulling a third along, presumably a casualty, though allowance has not been made for their bases, so they do not reach the prone figure properly. The largest piece is of course the stretcher party. Again all the bearers are different, and this is the first time such a common sight has been sculpted in plastic. However the figures are not all holding the poles at exactly the same height, which is a pity. Finally the fifer holds his instrument on the incorrect side. The sculpting on these figures is not the best, but the detail is pretty good and a lot of imagination has certainly gone into them. Like all the Strelets sets so far, this is a limited edition run and is certainly very collectable. With a better standard of sculpting this would have been almost unbeatable, but instead it is an interesting set that rewards a little patient tidying up.